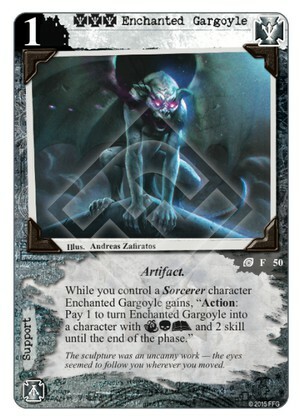 Flavor Text: The sculpture was an uncanny work — the eyes seemed to follow you wherever you moved. Plain useless in many situations though (no sorcerer, no available domain), and not a powerhouse for the cost you'll have to pay to attack AND to defend. 2/5. Useful complementary piece to the Sorcerer archetype as Sorcerers don't typically hold up well in direct combat. The "pay 1" could expensive in terms of opportunity cost, but there will be times when you'll be glad you have a cheap blocker in your back pocket. Not too shabby.